"A Psychic Service of Investigation blog novel"
Psychic Service of Investigation Agent Cassidy Parker dives toward potential futures to uncover crimes and prevent them. With her telepathic partner Rebecca, she stumbles upon a threat of massive proportions. Stopping it does not only involve investigating the situation but also a little arm-wrestling with PSI’s parent agency - the FBI - and a careful management of reader (telepaths and psychics) and non-reader relationships. What Cassidy hasn’t yet foreseen is that putting the bomber behind bars is barely the beginning. 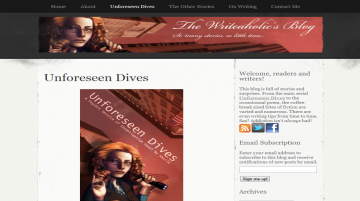 Unforeseen Dives has not been reviewed yet. Unforeseen Dives has not been recommended yet.